High-protein meal supplement. Dietary Supplement. High-protein meal supplement. Nutrition, energy, health. Scientifically complete. 42 g of high-quality protein per serving. Low-glycemic formula. L-glutamine & taurine. 27 Vitamins & minerals. Fat burners & lipotropics. Naturally and artificially flavored. Results May Vary. 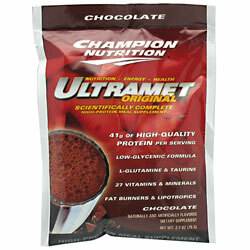 UltraMet can be an important part of a healthy lifestyle that includes a proper diet and fitness program. The words, health and healthy refer to the support of a healthy lifestyle for healthy individuals. The use of these words herein is not intended as a claim to cure or prevent disease. This product is filled by weight not by volume. Made in USA. Peptol EX (Proprietary Blend Consisting Of: Whey Protein Isolate, Calcium Caseinate, Milk Protein Isolate, Potassium Caseinate, Egg Albumen, Whey Protein Concentrate, Sodium Caseinate, L-Glutamine, Taurine, and Calcium Alpha-ketoglutarate), Maltodextrin, Lowfat Dutch Cocoa, Fructose, Natural and Artificial Flavoring, Vitamin-Mineral Blend Consisting of: (Dicalcium Phosphate, Magnesium Oxide, Potassium Chloride, Vitamin E Acetate, Ascorbic Acid, Ferrous Fumarate, Beta-Carotene, Boron Proteinate, Biotin, Niacinamide, Zinc Oxide, Manganese Gluconate, Vitamin A Palmitate, Calcium Pantothenate, Molybdenum Amino Acid Chelate, Copper Gluconate, Folic Acid, Vitamin D3, Copper Sulfate, Pyridoxine Hydrochloride, Thiamine Mononitrate Riboflavin, Chromium Polynicotinate, Selenium Amino Acid Lecithin, Salt, Xanthan Gum, Aspartame (Phenylketonurics: This Product Contains Phenylalanine), Cellulose Gum, CitriMax (Garcinia Cambodia Extract), Medium-Chain Triglycerides, Carrageenan, Bromelain, Borage Oil, Acesulfame-Potassium, Mono and Diglycerides. Ingredients: Peptol EX (Proprietary Blend Consisting Of: Whey Protein Isolate, Calcium Caseinate, Milk Protein Isolate, Potassium Caseinate, Egg Albumen, Whey Protein Concentrate, Sodium Caseinate, L-Glutamine, Taurine, and Calcium Alpha-ketoglutarate), Maltodextrin, Lowfat Dutch Cocoa, Fructose, Natural and Artificial Flavoring, Vitamin-Mineral Blend Consisting of: (Dicalcium Phosphate, Magnesium Oxide, Potassium Chloride, Vitamin E Acetate, Ascorbic Acid, Ferrous Fumarate, Beta-Carotene, Boron Proteinate, Biotin, Niacinamide, Zinc Oxide, Manganese Gluconate, Vitamin A Palmitate, Calcium Pantothenate, Molybdenum Amino Acid Chelate, Copper Gluconate, Folic Acid, Vitamin D3, Copper Sulfate, Pyridoxine Hydrochloride, Thiamine Mononitrate Riboflavin, Chromium Polynicotinate, Selenium Amino Acid Lecithin, Salt, Xanthan Gum, Aspartame (Phenylketonurics: This Product Contains Phenylalanine), Cellulose Gum, CitriMax (Garcinia Cambodia Extract), Medium-Chain Triglycerides, Carrageenan, Bromelain, Borage Oil, Acesulfame-Potassium, Mono and Diglycerides. Allergy Warning: Produced in a facility that processes milk, egg, soy, peanuts, soybeans, tree nuts, wheat and crustacean shellfish derivatives. Contains milk, egg and soy. Intended for human use by healthy, physically active adults. If you are pregnant, lactating, under medical care or using any medication, please consult your physician before using this or any dietary supplement. Notice: Use this product as a food supplement only. Do not use for weight reduction.